The Natural History Museum of Utah is located in Salt Lake City at the University of Utah. 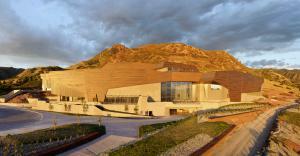 The museum is located in a new building that opened on 11/19/11 and is situated in the foothills of the Rocky Mountains, overlooking Salt Lake City and inspired by the diverse landscape of Utah. The $103 million Rio Tinto Center, funded by a public and private partnership, is deeply rooted in place and infused with multiple features that embrace both traditional and new media techniques – a new Museum that sets a new standard for a Natural History Museum of the 21st Century. For over four decades, the Natural History Museum of Utah has connected Utah residents and tourists alike with the natural wonders and native cultures that define Utah. As an active research institution with a remarkable and growing collection of more than 1.2 million specimens and objects, the Museum is an extraordinary cultural and educational asset for understanding the world. Over the years, the Museum has garnered the respect and affection of visitors, state and local leaders, scientists and museum professionals through programs of sustained excellence in the areas of public education, scientific research, collections preservation and environmental stewardship.